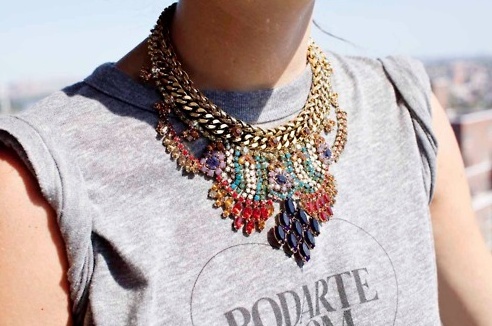 Huge necklaces with plain, a bit sporty-looking tops or huge, chunky knits. Is there anything more casual luxe-looking? This is the year of the glitz - the low-cost variety. Zara, H&M, Primark and Topshop are winners in the neck adornment category. A twinkly shirt and a knit jumper. A long, loose, glittery shirt-dress. A bit of an off-the-shoulder shimmer. And I'm not just talking nighttime. This year, we should all dare to sparkle twenty-four seven! I love my H&M necklaces and Accessorize bracelets (sorry, I refuse to call it an "arm party") but maybe stepping out of my twenties will be the turning point when I go for the one pair of quality silver earrings instead of the five-for-one deal that will go rusty at the first London downpour. As a vegan, It bags are out of the question (unless they're Stella McCartney) and I always have to flip the pages right past the "new boots!" pages in magazine as they're all leather. But at least I can put my cash on well-made, beautiful jewellery. Make the most of my elderly jeans. I have this one pair of straight-leg Mango jeans that's age-old. I mean, I was still in college, that's how old. I still love them - but they've gotten saggy and started spurting holes in all the wrong places. So, I figured, why not go all the way? This spring, I'll go crazy with some sand paper from my boyfriend's toolbox and turn my ageing jeans into a cool-as-new, stylishly ripped pair. Say "thanks but no thanks" to kitten heels. I know they're the coolest of the cool this spring and all the It girls will be parading right to their front-row seats in them. But, as it happens, I've worn kitten heels before, and I know I look crap in them. My general shoe rule is, "would Victoria Beckham wear them?" and in her fabulouser-than-fabulous book "That Extra Half and Inch", she clearly states that she wouldn't. It's either flats (Converse, biker boots) or skyscraper, dahlings. I think we all know by now that a good basic wardrobe is key, but I find it even more important for cruelty-free dressers as we can't rely on "It" accessories to smarten up our outfits. We really need that structured wool-free coat, that blazer, that well-cut pair of trousers. Yes, it does cost more. No, I can't afford it yet. But this year, I'll at least try, instead of always going for the funkier low-cost version of everything. Check out my article On Being Vegan and Working in Fashion on ChicVegan - I'm really happy I wrote it. The fashion world is not always a vegan-friendly place, but the more of us want change, the more likely it is to happen. Style can be compassionate! Sounds like a plan and I LOVE it! Great article on Chic Vegan :) this is also the year where I only wear cruelty free and vegan clothing, i'm looking forward to the challenge. Have you heard of HonestBy.com? It's has great designers and some good quality clothing (although pricey), there's also a vegan option!